SASVEPM successfully hosted a CE course in May in Pretoria which was presented by Prof. Geoff Fosgate and Prof. Peter Thompson of the University of Pretoria, Faculty of Veterinary Science, entitled Disease Outbreak Investigation. It was a computer based course held over four days. Much hands-on experience on data cleaning, scenario analysis and statistical manipulation was presented. The various steps in a classical outbreak investigation in a outbreak of unknown aetiology were thoroughly work-shopped. 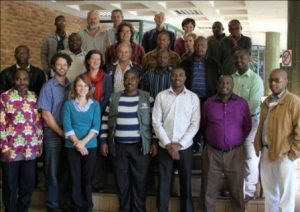 Groups did a report back on their findings from a dataset supplied, with possible scenarios and interventions.Twenty one veterinarians and animal health technicians from all over South Africa attended. Feedback was very positive with comments like; “an excellent initiative and very relevant’; “very informative’; “enjoyable”; and “the interaction was superb”.SASVEPM hopes to be able to present this course on a regular basis and even to extend the content to a second phase. Information in this regard will be sent to members.